Today would've been Dad's 65th birthday but not once was his heart older than 20. He loved, he laughed and he had a hug for everyone. It's so hard to accept that he's no more and harder to observe a birthday where he hasn't been the party planner. 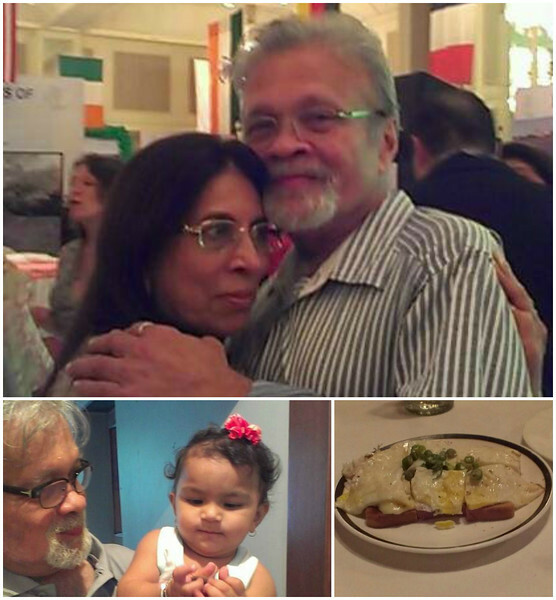 Here are a few old pictures that draw a portrait of the man he was... with his favourite muses...mom Swarup Javeri and Anika. Also, there's his favourite Kejriwal egg dish from Willingdon. How can we have a birthday for him with no eggs?? Miss you more than I can ever get myself to admit, Pop. Hope you're having a drink up there. Coz we're surely gonna have one for you. Happy birthday, Pop. Love always. I just have to say that I miss Harsh so much. I miss his photos, his love of life, his love for family and his cheerful character. I miss him so much. An older photo of mine popped up on SmugMug today that had a comment from Harsh. I just wanted to honor his memory, his character and his giving heart. I miss you Harsh so much. Blessings to his family. Thank you all, so much for the kind words! It's heart-warming to know that so many people who he hadn't even met or 'spoken' to still remember & think of him so often, and more importantly take the time to leave a message here. He truly was special! So nice to see these photos of Harsh! He is still missed. It is so good to see these shots of Harsh. He was so loved among smugmug photographers. We loved his zest for life and his energy and desire to contribute fully to the community. I think of him very often, too, and love seeing his photos pop up on the dailies occasionally. I'm sure he left a terrible void in the lives of your family, but he is very much missed here, as well. Awe, I so miss Harsh and his friendship. What a wonderful tribute to a beautiful man. It's still hard for me to think that he's no more, I think of him often. I still have the last email he sent me on my photo. It always brings a smile to my face. Cheers to him, and happy birthday in heaven Harsh. Thanks for posting this tribute to a wonderful gentleman. Miss his wonderful street photos! HB Harsh! Hope you are having your egg dish and watching your family toast you. xxxx Thanks for sharing Jay!